These super fluffy eggnog cinnamon rolls are made with eggnog, filled with spices, and drizzled with eggnog glaze. 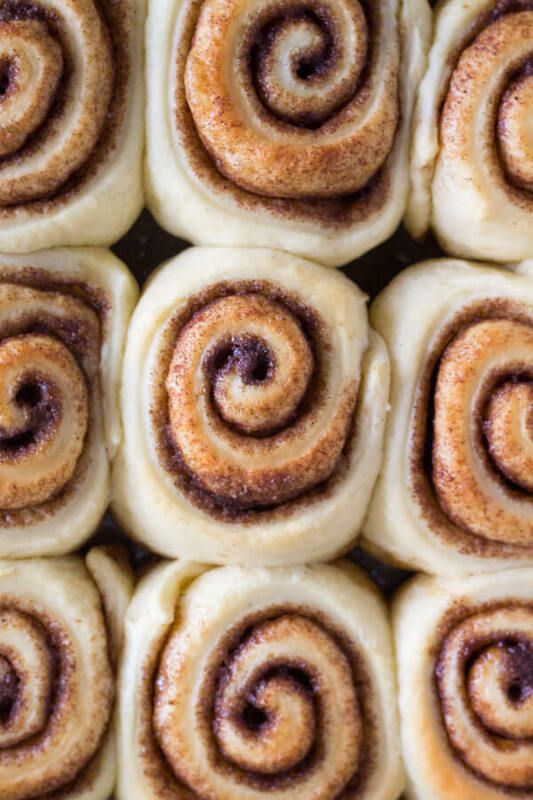 Prepare the buns overnight, then wake up to warm cinnamon buns on Christmas morning! 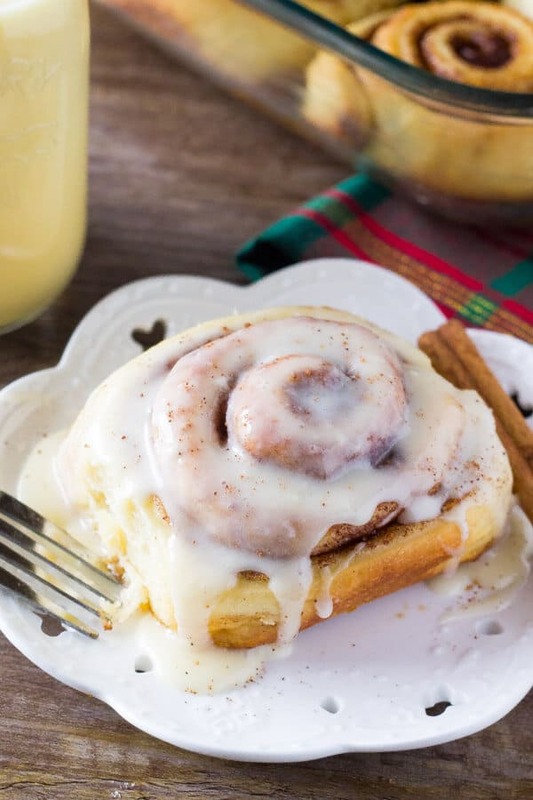 Today I’m kickstarting the holiday baking with super fluffy Eggnog Cinnamon Rolls with Eggnog Glaze. Maybe it’s a little early – but I like to taste test ALL my holiday treats at least twice prior to the big day. (Quality assurance is very important). Plus, once the weather turns cold there’s nothing better than turning on the oven, and filling your kitchen with the smells of fresh bread, cinnamon goodness and delicious eggnog. Now – I love eggnog. (Last Christmas I made eggnog pancakes and eggnog cupcakes with eggnog buttercream all in one week.) And I love cinnamon rolls. And when you combine eggnog with fluffy, pillowy soft, cinnamon rolls spiralled with cinnamon sugar and drizzled in eggnog glaze… Drool worthy. 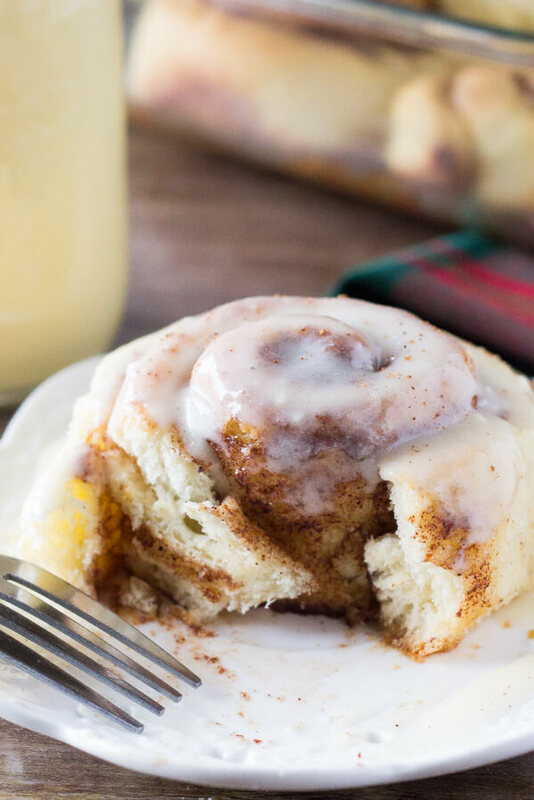 These eggnog cinnamon rolls have a hint of eggnog and you can definitely taste the nutmeg, but the flavor isn’t overwhelming. So whether you love eggnog or not – you can think of these as your favorite super fluffy cinnamon rolls filled with yuletide cheer. Now for this recipe, we’re making homemade cinnamon rolls with yeast. Yeast is what makes our cinnamon rolls super fluffy and soft. It means the recipe is more time consuming, but you can do most of the prep work the night before then pop the prepared buns in fridge and bake them the next morning when you’re ready to enjoy. First we need to proof the yeast. This basically just means we’re getting it ready by adding the yeast to warmed eggnog. Your eggnog should be warm, but not scalding. If you have a thermometer, about 100F/38C is where you want to be. Then let it sit for about 10 minutes. If you don’t see bubbles forming and it isn’t expanding in volume after those 10 minutes, then your yeast isn’t active and your cinnamon rolls won’t rise. (It’s better to realize 10 minutes in instead of when the buns are in your oven). While the yeast is proofing we’ll stir together our flour, sugar, a little nutmeg and salt in a large bowl. Then stir in our warmed eggnog and yeast once it’s ready, melted butter and egg. The batter gets folded together using a large wooden spoon or rubber spatula, then it’s time to knead the dough. I do this by hand on a lightly floured surface, and after about 5 minutes the dough should appear smooth and elastic instead of shaggy. Then we leave the dough to rise til it’s doubled in size. We then punch the dough to let out the air (seriously the funnest thing ever), then roll it out into a large rectangle. Very soft butter gets spread over the whole thing, then we sprinkle our mixture of cinnamon sugar over top. We roll our rectangle of deliciousness is into one big log, we pinch the edges closed, and slice into cinnamon rolls. Now – at this point you can decide to refrigerate the rolls overnight and bake in the morning, or bake them right away. 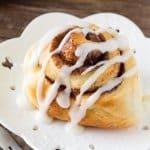 Making overnight cinnamon rolls is definitely a great idea if you want warm delicious goodness for breakfast, without having waking up super early. After baking the eggnog cinnamon rolls, they’re drizzled in eggnog glaze for the ultimate indulgence. I’m adding these to my Christmas morning menu – but I definitely won’t be waiting that long to try these again! 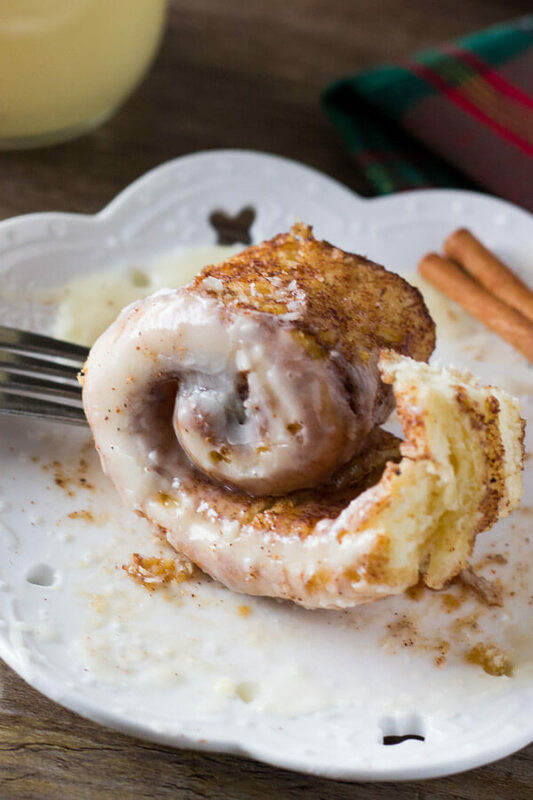 These super fluffy eggnog cinnamon rolls are made with eggnog, filled with cinnamon sugar, and drizzled with eggnog glaze. You can prepare the buns overnight, then pop then in the oven in the morning when you're ready to enjoy. Perfect for Christmas morning! Heat the eggnog in a small saucepan or the microwave until it's warm but not boiling (about 100F or 38C). Mine took about 35 seconds in the microwave. Add the yeast to the warm eggnog and let sit for 10 minutes. It should form bubbles and the yeast should expand. If you don't see bubbles, then your yeast is no longer active and won't work. In a large bowl whisk together the flour, sugar, salt & nutmeg. Then stir in the egg, melted butter, and eggnog & yeast using a large wooden spoon or rubber spatula until combined. It will look shaggy. On a lightly floured flat surface working with floured hands, knead the dough for about 5 minutes until it's smooth and elastic in consistency. Grease a large bowl, place the dough inside and cover with clingfilm. Allow the dough to rise for about 1 to 2 hours or until the dough is doubled in size. If your kitchen is cold, this process will take longer. Once the dough has doubled in size, punch it down to release the air. On a floured surface using a floured rolling pin, roll the dough into a rectangle shape about 10 inches by 14 inches. Then spread the very soft butter onto your dough - it needs to be very soft or else you can rip your dough. Grease a 9x13 inch baking pan very well, and place your cinnamon rolls in the pan. If made only 9 rolls, you can place them in a well greased 9 inch pie plate instead. If baking the rolls the next morning, cover the baking pan/pie plate with clingfilm and place in the fridge. The next morning when ready to bake, remove the pan from the fridge and allow the rolls to come to room temperature. Allow the rolls to sit for at least 30 minutes to warm up. Then preheat the oven to 350F degrees and bake for 22-25 minutes, or until the tops are starting to turn golden. 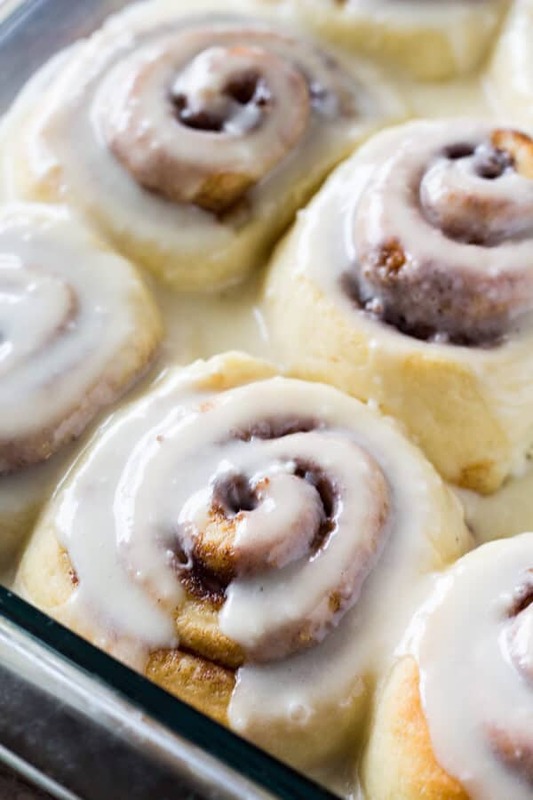 If baking the rolls straight through, after placing the cinnamon rolls in their greased pan allow, cover with clingfilm and allow to rest for about 20 minutes to continue rising. Then turn on the oven to 350F, and once the oven has preheated bake the rolls for 22-25 minutes or until the tops are starting to turn golden. Make the glaze by whisking together the eggnog, powdered sugar, and optional rum extract until no lumps remain. Then pour the glaze over the warm rolls and enjoy. Fiona Fiona Fiona, these were simply THE BEST!!! Prep them Christmas Eve, and baked them Christmas morning. OMG sooo good, these went well with my Big Christmas Breakfast. Thank you for this awesome recipe. 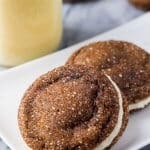 Hi Fiona , is there a way we can make the cinnamon n brown sugar ooze out of the buns ? The pictures are mouth-watering! Can’t wait to make these.